On the same day three Quinnipiac men’s basketball players were arrested, the Bobcats were defeated by the Sacred Heart Pioneers 68-55 Thursday night in the first game of Northeast Conference play at the TD Bank Sports Center. 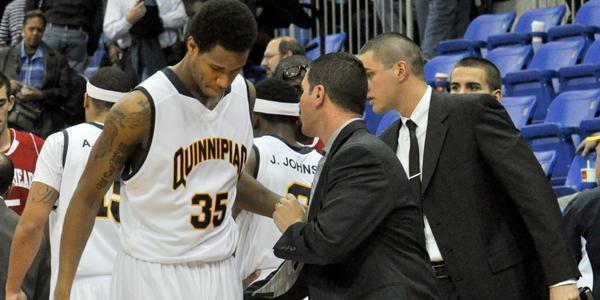 Quinnipiac (2-4, 0-1 NEC) has now lost three consecutive games. Quinnipiac guards Dave Johnson and Nate Gause and forward Jamee Jackson had been arrested earlier in the day on assault charges stemming from an on-campus fight on Sept. 18. The three combined for just seven points and seven turnovers. Quinnipiac head coach Tom Moore said that the incident had no effect on the team’s efforts, and senior guard James Johnson, who was also involved in the case, echoed his sentiments. “Once we step inside those lines, it’s all about basketball,” James said. The Bobcats struggled from the field converting 31.3 percent of their shots throughout the game, and their 55-point performance was their second-lowest on the season. Forward Ike Azotam led the way for the team with 18 points, and James contributed 15. Sacred Heart (5-3, 1-0 NEC) controlled the pace early on, as guard Shane Gibson, who finished with 21 points, led an early attack with six points in the first two minutes of play. Forward Chris Evans would also aid Sacred Heart in the first frame with nine points. After being down 11-8 with over 13 minutes to play, the Pioneers would come back and never trail again. The second half saw Quinnipiac attempt to mount a comeback behind strong scoring outputs by Azotam and James Johnson, but nobody else was there to answer Moore’s cry for shots. Even as the game reached a six-point deficit at 55-49 with six minutes left, Sacred Heart built a 9-0 run that lasted four-and-a-half minutes and saw James Johnson and fellow guard Garvey Young foul out shortly after, and the Pioneers cruised to victory. Moore’s Bobcats also struggled from the free-throw line, going 9-of-20 from the strip. Sacred Heart was able to convert 20 out of their 29 attempts. Even though they won the battle of the boards 45-39, the Bobcats also out-fouled the Pioneers 23-19. Outside of Azotam and James Johnson’s double-digit performances, the Bobcats received no help on the scoring end. Young and guard Zaid Hearst each added five points, which was the next-highest scoring output. Even so, James said much of the blame is on his own leadership quality. Additionally, Dave’s rocky start has been an area of concern for Quinnipiac. Dave went 0-for-8 on field goals Thursday night in 25 minutes of action, and is averaging just 5.2 points per game on the season. Still, Moore displayed clear concern with the state of the Bobcats following Thursday’s loss. The Bobcats will remain home to face Bryant (1-6, 0-1 NEC) in yet another conference battle on Saturday at 3 p.m. James Johnson said his team needs to stay focused.